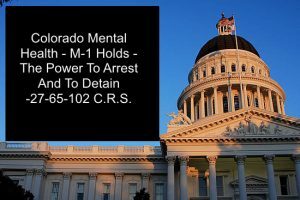 Colorado Mental Health M-1 Holds – The Power To Arrest And To Detain – 27-65-102 C.R.S. Colorado Mental Health M-1 Holds – The Power To Arrest And To Detain -27-65-102 C.R.S. – On December 31, 2017, Douglas County Sheriff Zack Parrish, 29, was shot and killed by Matthew Riehl. Four other law enforcement officers and two neighbors were also shot, but they survived. While I have written on M-1 Holds before – in light of Officer Parrish’s tragic death – I thought it would be the right time to revisit the area. Officer Parrish was a hero and was enforcing one of the most dangerous laws required of Colorado law enforcement. The M-1 Hold places a duty on the shoulders of the brace men and women patrolling our streets to take into custody – most often against their will – persons suffering from extreme mental health issues. Like many other cases that end up in the criminal justice system, there were numerous warnings that led up to this tragic ending. Riehl was bi-polar and suffered from PTSD. As is common – he had stopped taking his medications and was not receiving treatment of any kind at the time he was contacted by Douglas County Deputies. There are limits on what the State can do for an adult who refuses to comply with the kind of treatment that would control for their mental health issues. The Colorado Mental Health M-1 Hold is a poor and very dangerous substitute for comprehensvie mental health care. Many professionals in this area, through as organizations such as NAMI, are working day and night to solve this difficult problem. It may seem obvious, but as a recent politician put it – having a mental illness is not against the law – it’s not a crime. Arresting someone – taking someone into custody is considered the last option chosen among a limited number of other options. The law reflects this troubling problem. In Colorado, and in most other states, sets a very high bar before someone can be seized involuntarily for mental health reasons. In 2016, 37,771 people were placed on mental health holds in Colorado and some people were placed on more than one M-1 Hold. While the statistics are rough authorities believe there were a total of 52,661 involuntary 72-hour holds. To be “eligible” to be involuntarily taken into custody a person must be an imminent danger to themselves or others or so gravely disabled by mental illness that they cannot feed or care for themselves. The decision on when and under what circumstances a person can be arrested on an M-1 is carefully controlled by statute. While family members may ask for an M-1- Hold – only a law enforcement officer or a licensed medical or mental health professional can make the decision to place someone on a hold. A family member cannot. Mental health holds are viewed as a last resort and issues of civil liberties are always present because the M-1 hold procedure always provides risks both to the detainee and to the persons responsible, usually cops, for placing the holds. 2. A concern that people might be harmed as evidenced by a recent overt act, attempt, or threat to do serious physical harm by the person in question. Trying to factor in these standards still require a judgment call on what is “imminent” – when it is necessary “right now” to effectuate the arrest. The term “imminent” applies to the proximity in time of the dangerousness. “Imminent” applies to a determination of whether the danger to others or himself or herself is current – it does not apply to how soon in time a specific dangerous act may be undertaken. As of August 2017, Colorado authorities may no longer use jails to lock up people who are suicidal or in mental health crisis. Placing the mentally ill behind bars, as barbaric as that sounds, was common in many Colorado communities because of a lack of bed space. Prior to this correction in the law, only 7 states permitted the practice. Now there are only 6. Colorado Senate Bill 17-207 bans the use of jails to house people who are a “danger to themselves or others” but have not committed any crime. A Comprehensive Review Of The Colorado M-1 Involuntary Commitment – The Mental Health Hold – Section 27-65-102 C.R.S. Colorado Revised Statute 27.65 Title 27, Article 65, of the Colorado Revised Statutes contains a number of laws relating to behavioral health situations. then a person specified in subparagraph (II) of this paragraph (a), each of whom is referred to in this section as the “intervening professional”, upon probable cause and with such assistance as may be required, may take the person into custody, or cause the person to be taken into custody, and placed in a facility designated or approved by the executive director for a seventy-two-hour treatment and evaluation. 4) Licensed marriage and family therapist, licensed professional counselor, or licensed addiction counselor who by reason of postgraduate education and additional preparation has gained knowledge, judgment, and skill in psychiatric or clinical mental health therapy, forensic psychotherapy, or the evaluation of mental disorders. 5) Licensed clinical social worker. Under an M-1 hold, a licensed provided only has up to 72 hours to provide evaluation and treatment. Again, the 72 hours is for treatment and, more importantly, evaluation to determine if they need to be involuntarily committed to treatment. What Happens At The End Of The 72 Hours Period? 3. The court may be asked by the Hospital to extend the hold up to an additional 90 days. If the M-1 hold is extended it is called an ‘M-8 Hold’ or an ‘M-8 certification’. If proper procedures are followed, the patient’s hospitalization can be extended usually by another 90 days under an M-8 Hold. For some excellent direction from a Colorado in this area – follow this link to licensed psychiatrist Dr. Max Wectel. H. Michael works hard to get his clients the best possible results in and out of the courtroom. 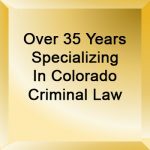 He has written, and continues to write, extensively on Colorado criminal law and he hopes this article helps you in some small way – Colorado Mental Health M-1 Holds – The Power To Arrest And To Detain -27-65-102 C.R.S..